Our new design incorporates a screwed in side cartridge assembly for a tighter fit to insure fewer cross overs. Our hardened chambers resist scoring and the 100% pure titanium side seals are superior to anything in the market. The hardcoat anodize surface is coated with PTFE. This combination gives superior surface life and easier cleanup. This design was created to eliminate the hassle and expense of cross overs, down time along with a much lower cost for parts. We have an adapter plate # AP3-KT-17 that will mount this body to your Fusion AP handle. 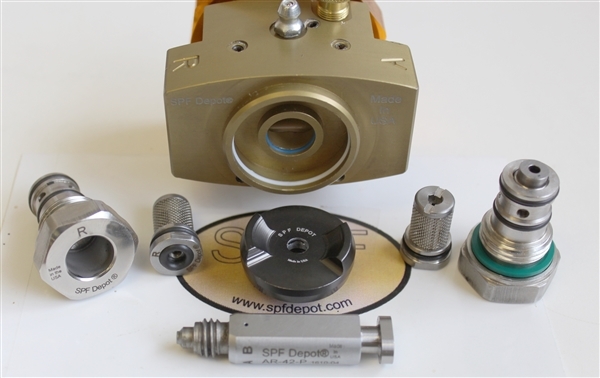 SPF Depot AP3 complete front end assembly. 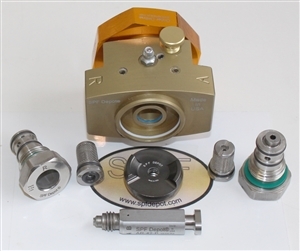 Comes with 90 Durometer O-Rings, Pure Titanium side seals, Platinum series chamber that resists scoring, complete side cartridge and check valve assemblies and air cap. Available in Hard Anodize with PTFE top coat and in Nickel Plate. Adapter plate sold separately to mount to your Fusion AP handle.